Tribes Overall: "Although the boat - and hence the itinerary - was changed at the last minute, this visit to the Galapagos was absolutely brilliant! Getting close to wildlife in pristine surroundings was unforgettable. The crew of the Seaman was great in all respects: especially the food, and the service could not be faulted. " Tribes Service: "Paul was very helpful and supportive throughout, especially as I decided to make my own flight and accommodation arrangements apart from Galapagos. However, I would rather have flown on from Guayaquil the same day rather than hang about for a day in a rather boring city. " 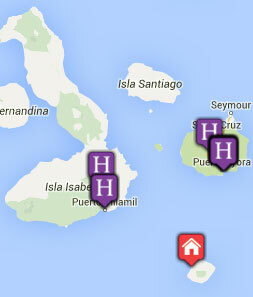 Guides: "Henrique must be one of the best guides in Galapagos. His knowledge and enthusiasm were outstanding in all respects and I was surprised to learn from him while we were both waiting for flights from Baltra that there are no formal qualifications or checks on guides by the Tourism department. " Social & Environmental Responsibility: "Keeping the human impact on Galapagos to a minimum is crucial, and we felt that we were able to assist in the way the activities were conducted as well as understanding the needs of the locals on the populated islands. " The food was incredibly varied, healthy and plentiful. We were well looked after in all respects: Zodiac transport, welcoming back on board with towels and refreshments and a general feeling of a crew that worked together and enjoyed their jobs - nothing was too much trouble. "Getting close up to iguanas, sea lions, turtles and so many different birds and fish was amazing. "